For those of you who wonder how I do logos or wedding invitation lettering, here is a (very) quick tutorial on the steps I take! The first step is to draw the lettering. I use a regular mechanical pencil for this, and do not worry about my lines being precise or clean. In the past, I never used straight lines as a guide, and sometimes I still don't, but when I want to make sure my lettering is straight for aesthetic purposes, I use a ruler to draw my guidelines. Depending on the lettering I am doing, I might fill in the blank spaces. For this particular project, I waited until I was on the computer to fill in the letters. 2. The second step is to trace the lettering exactly how you want them using tracing paper. This is where I make sure the lines are clean and how I want the final lettering to look. 3. 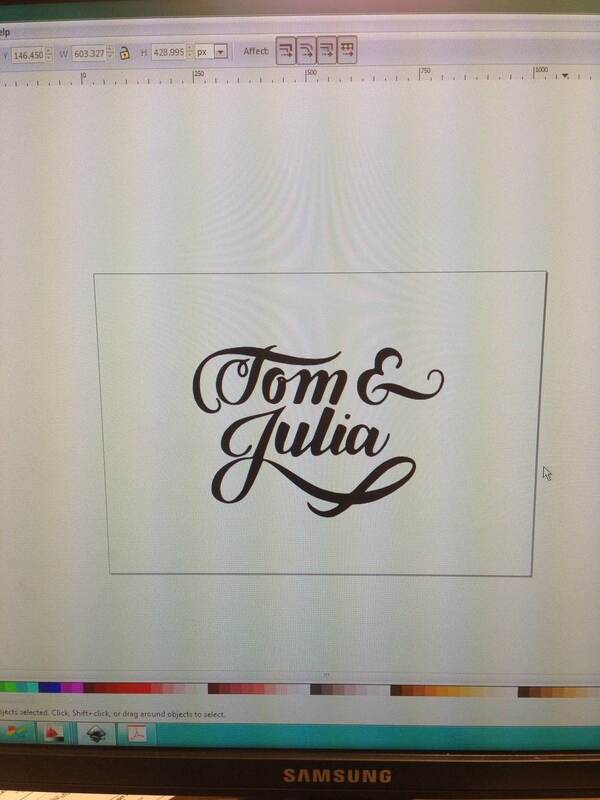 The third step is to scan the tracing paper to the computer so I have an image file of my lettering. Make sure the resolution is high, and you get a clear scan of the work. I always increase the contrast using some picture editor on the computer to make the black lines stand out against a white background before I move onto the last step. 4. The fourth and "last" step is to use a computer program like Adobe Illustrator or Inkscape to import your image and either manually trace the lines (very tedious) or use a live trace feature. I use Inkscape because it's free, and I find that it does everything I need it to in order for me to provide clients with final vector and image files. Once I have my lettering in Inkscape, I simply use the program to clean up my lettering, fill in any blanks I left from my tracing, and generally get my work to a professional level. I'll post another tutorial some other time explaining what all of that cleaning up entails! Thanks for reading, and let me know if you have any questions about these steps!